A gentle tongue is generous, kind and patient. A gentle tongue soothes and heals and builds up. Dear Lord, today I pray that my tongue will be gentle and speak only soothing, healing words. 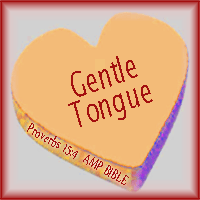 I pray for a gentle tongue that is patient and only speaks kindness. I want my tongue to become a tree of life to those around me.